The team is divided into 3 levels: Junior, Intermediate, and Senior. 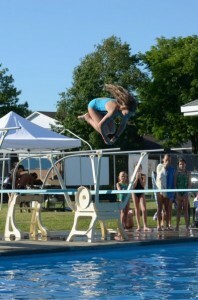 Juniors are 11 years old or under and must perform 3 dives in order to compete. Intermediates are between the ages of 12 and 14 and must be able to perform 4 dives. At the senior level, participants are at least 15 years of age and must be able to perform 5 dives in order to compete. Diving meets are held once per week on Monday nights at the beginning of the season. In order to compete in the semi finals, the NAA stipulates that a diver must have competed in at least 2 diving competitions throughout the summer. At the end of the summer, should it be the case where the number of divers exceeds the standard, the coaches will tabulate individual scores to determine who qualifies for the semi-finals.